When we have company coming to stay overnight, I like to prepare a few special guest room touches. It lets them know that I am happy to have them. My sister was just here for a quick visit, so I took some photos. That’s the way ALL my blogs posts start out…either by preparing something or researching or finishing a project…I’m just lucky when I remember to take photos! 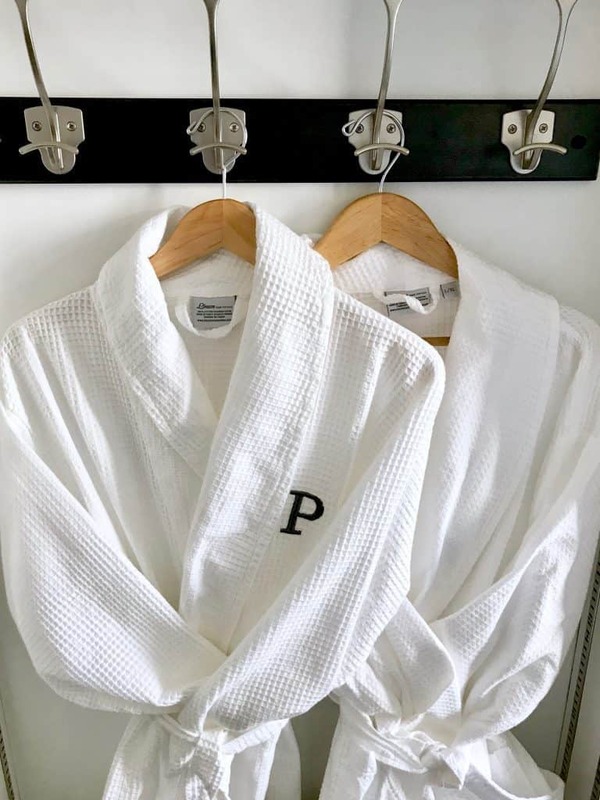 Monogrammable hotel robes from Overstock–We have two sizes that I keep freshly laundered. 2. Fluffy towels (I like the white Fieldcrest ones from Target). 3. 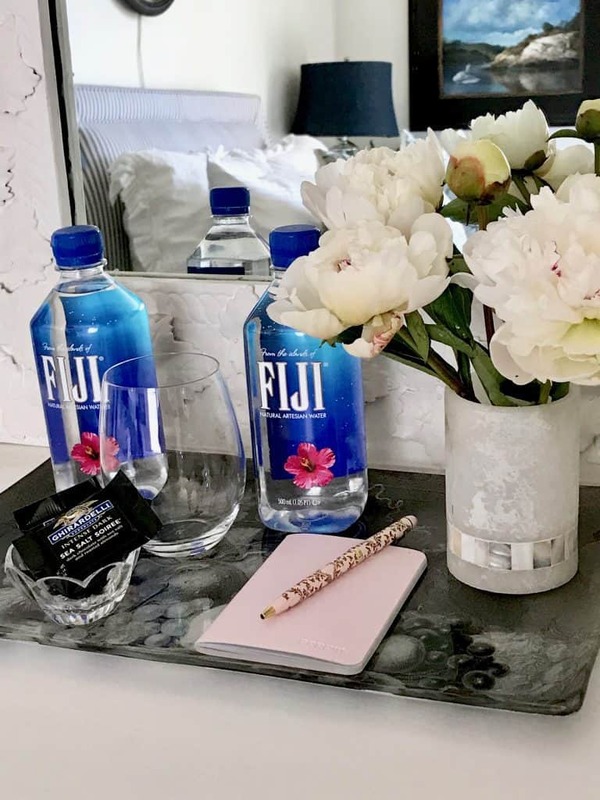 Fancy Water bottles (hey, do you know how much those would cost in a REAL hotel?) 4. Local Chocolates (we love these). Ghirardelli Square is not far away. 5. The pink notepad has the internet code inside 6. Fresh flowers are always nice. 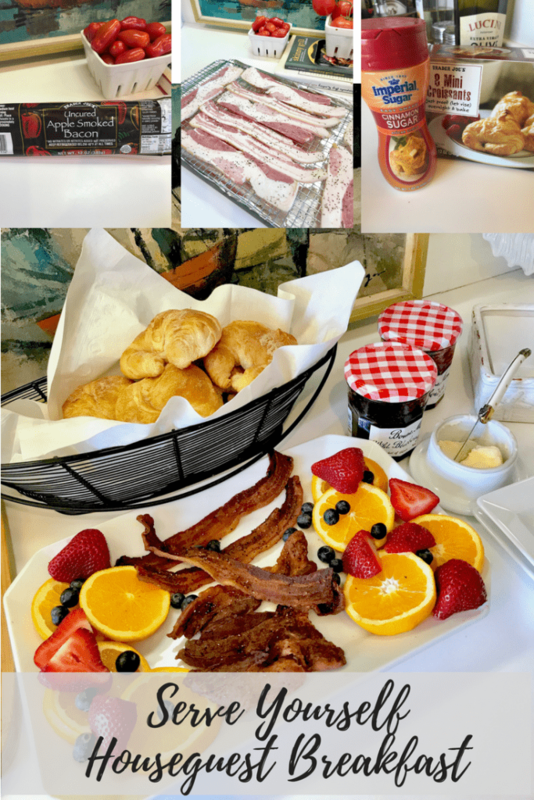 In the morning, I let guests wake up when they want… but the smell of bacon gives them a nudge. 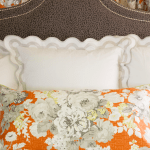 Do you have any guest room touches that you like to do? I’m so excited! We are going on vacation to Dublin with my husband, daughter, and son (going back to my roots…I’m Irish on my dad’s side) and then meeting friends in France…follow along with me on Instagram! 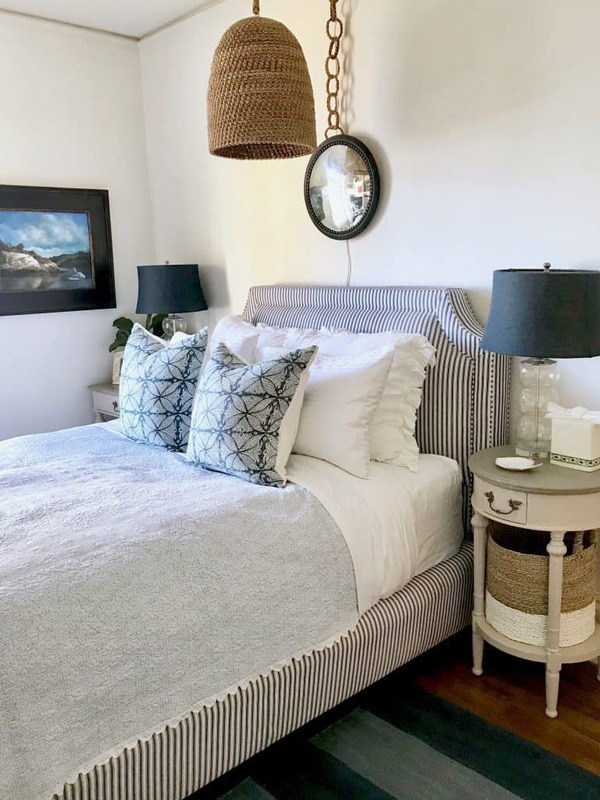 What a beautiful guest room you have! 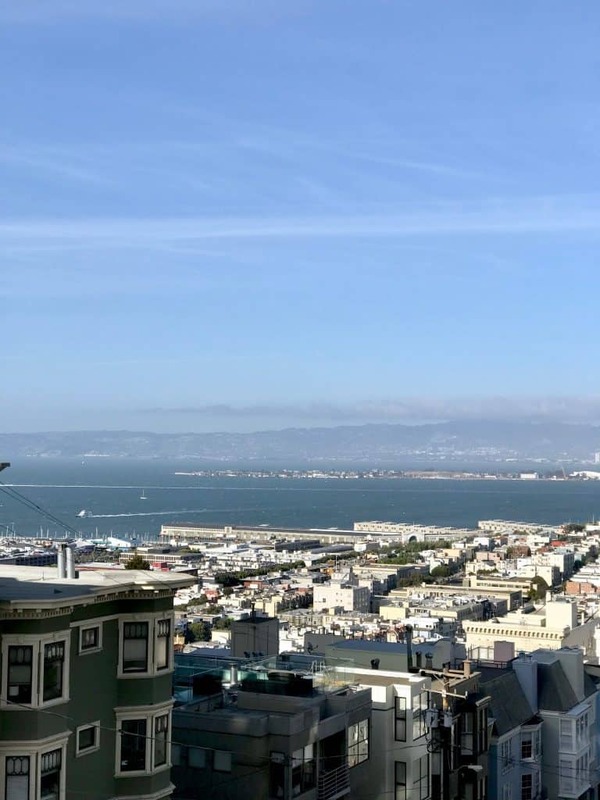 I would love to come visit….and the view from your room certainly tops what my friends get to see! Thanks for a great post! You make your guests feel so special. I love being a guest at your house! I need to follow your lead and step up my game!! P.S I got your post in my mailbox today. Maybe mailchimp heard our conversation! 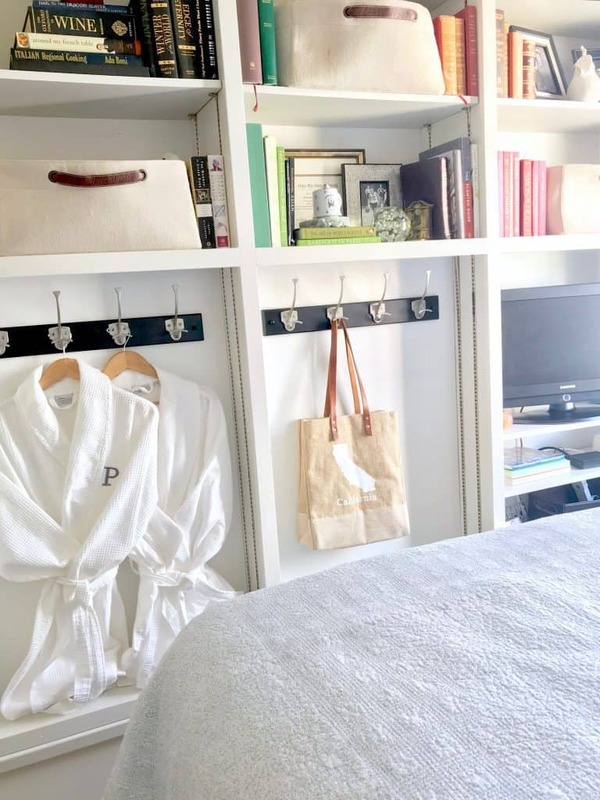 Great guest room tips! 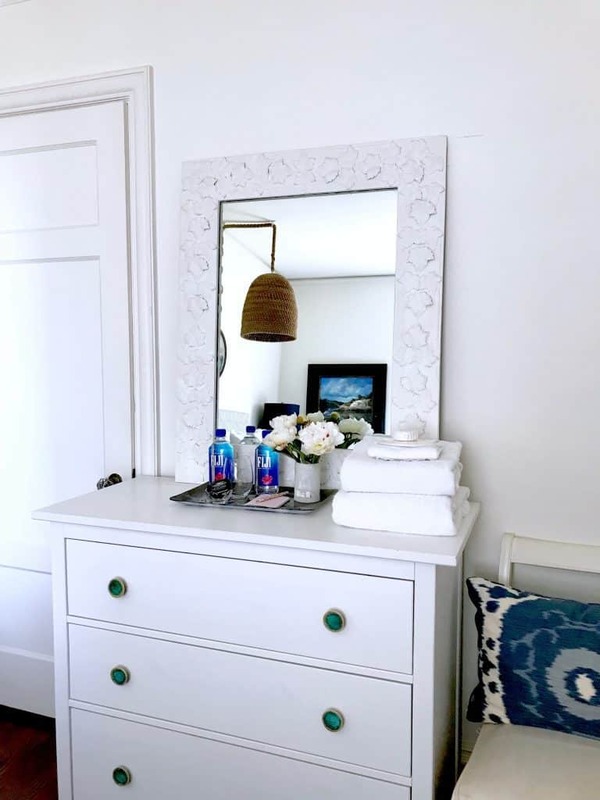 I love your blue and white room (same as mine!). 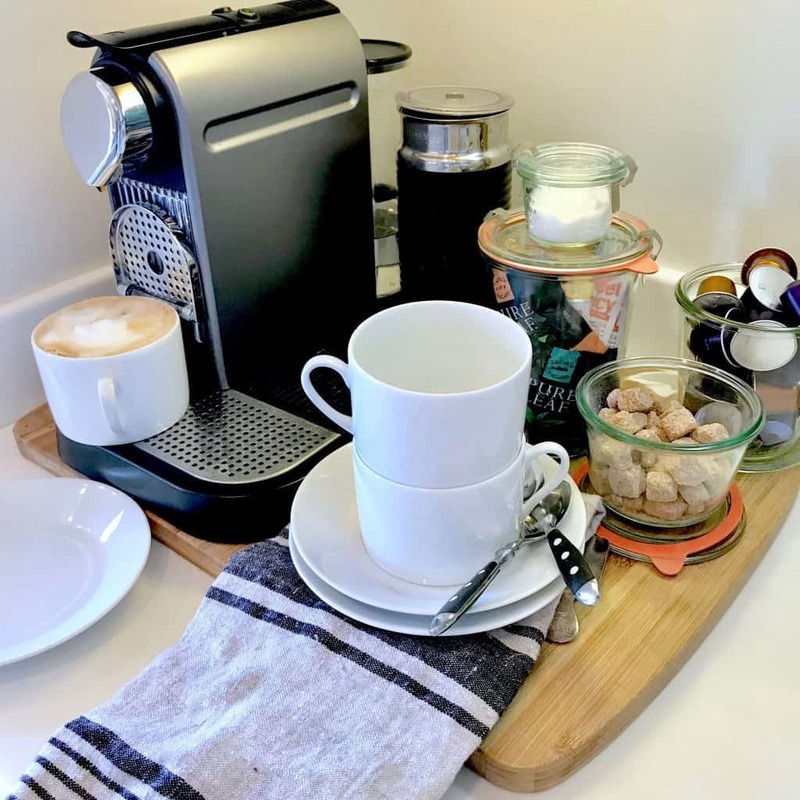 Another nice touch is to leave your wi-fi user name and password printed on a card on the bedside table so that your guest can easily connect. Also a comfy, soft throw at the end of the bed is a great addition in case they get chilly. Good points, Joy! I do have a cashmere throw in a basket on the other side of the bed. And the wifi passcode is in the pink notepad…but it’s not readily visible…need to do that. I want to stay at YOUR house! Thanks for the informative post! I really like how you make your guests feel so pampered, but still at home! Have fun in Ireland! I’ve always wanted to go! Wow, you know how to treat a guest! I’m surprised someone isn’t visiting all the time! Can’t wait to get the details on your trip to Dublin, we want to go too as I am 100% Irish. Have a wonderful time Mary Ann and stay safe! I already do most of those tips, but the photo idea is genius! What a way to make your guest feel treasured! Wish I were going to Dublin. I look forward to your pictures! Thanks,Jane. You crack me up with the HARRIGAN. I am sure your guest feel so special staying at your house! I love all the nice touches and that amazing view! Wow, not only do you give your guests the royal treatment, but they get an amazing view! I wouldn’t want to leave! We have a dresser that’s empty, so they can fill it with their stuff, instead of digging in suitcases. And a couple of empty shelves for spreading out things they want to see (makeup, gadgets, jewelry…). We also have a clock, but one guest took out the batteries because of the ticking. It’s true that it gets very quiet, and a clock can seem very loud. Loved all the touches!!! Enjoy your European adventure. Can’t wait to see the photos!! so many great ideas that I can’t wait to implement them myself! Thanks! I bought it 10 years ago from WS Home. I’ve seen similar ones at Pottery Barn. Thanks! wow, I see why you couldn’t help me with my Mn. cabin, you have been on the run. I am using your ideas as I go along. We were in Ireland and Dublin last August, great fun and food. I keep a small basket stocked with travel size toiletries, men’s and women’s in case they have forgotten something. Some are practical, others are special finds that I gather throughout the year. I love your taste and decorating advice….esp. the glimpses of San Francisco, where my husband worked after we were first married, and living in Tiburon. Such a romantic place to begin married life. Ultimately missed our beautiful Oregon and returned home. 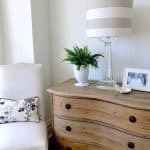 I have often wondered looking at your lovely homes, where is the clutter and how do you contain it? 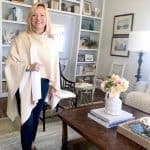 As empty nesters for several years, and approaching a huge change in lifestyle, to downsizing, it is overwhelming. I know my boys and their wives will not want most of the antiques, China, etc. they are the Pottery Barn, Target, West Elm generation. A garage sale is overwhelming to consider. Maybe you or your readers have suggestions. I wonder where all these life accumulations will end up? Thank you for the beautiful inspirations!! I’d like to make a reservation, please! Hee…hee! I love your posts, Mary. And thanks for the tips. 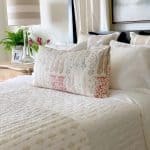 To be honest, the way you display the guest room displays how much you value your home and people around you! Thank you so much! Such a pretty room for your lucky guests. And know you will love Dublin. We were there last May and had such a great time, are returning in September. The Irish people are some of the nicest people we have ever met. 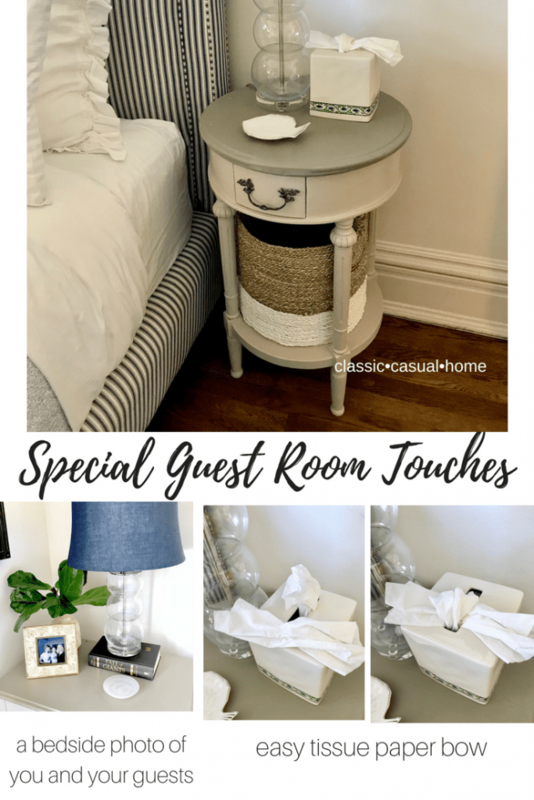 I love all of your tips for making guests feel welcome. I do many of the same things and the guests always enjoy the personal touches. Have a wonderful time on your trip, safe travels. NO GUEST ROOM HERE Just THE BOYS OLD ROOM which is NOW MY ACCESSORY TOSS ROOM!!!!!!!!! What lovely details, MaryAnn. Would make a guest feel like they were in a luxury boutique hotel suite!